A lightweight pack that carries loads well, is affordable and looks stylish to boot… Is this overnight backpack too good to be true? As part of an ongoing quest to cut down on pack weight, I acquired the unique-looking Boreas Lost Coast 60 based on both its reputation (it won the coveted Backpacker Magazine’s Editor’s Choice Award) and its features (a 60L pack that weights in at a mere 1.52kg while still featuring a few bells and whistles such as hip belt pockets, hydration bladder compatibility, daisy chains for strapping gear, rain cover and a top lid with zip pockets). It even comes in a few colours. I got mine in Marina Blue. The pack is made by a small San-Francisco-based company, Boreas Gear, who have a big emphasis on great and innovative product design. They have just started distributing their products in Australia. After putting the Lost Coast 60 through its paces on both hiking and climbing adventures I can comfortably declare that this was money well spent. The total pack weight, including pack, varied between 10-18kg (possibly a bit more at times). 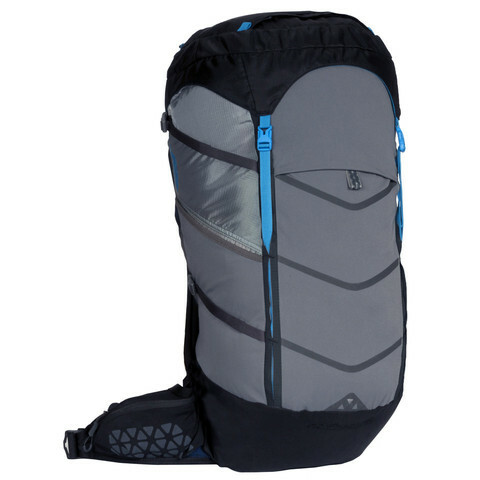 The harness system on this pack didn’t seem particularly sophisticated on paper: it doesn’t have any moving parts like, say, my Macpac Cascade 75 or similar-sized lightweight packs such as the Black Diamond Infinity’s ergoACTIV suspension. But in the field, this pack carried all my gear perfectly and I felt stable, even when scrambling up some steep, rocky paths. It swallowed my rope and rope bag without a problem. Support is provided by a rigid plastic sheet and aluminium frame inside the pack (the plastic can be removed if you want to save another 400g or so and go ultralight). I was able to easily fit all the gear required for a solo overnight hike, even though I was carrying a 3-person tent. Using a smaller tent solo or traveling in a group, I reckon this pack could easily work for a 2-3 night hike. With extra attention to weight and bulk, I wouldn’t be surprised if you could go backcountry for 5 nights (with some caveats below). There is only one main compartment and the pack is top-loading so access to contents at the bottom of the pack is limited. However, all the external pockets (including some voluminous hip belt pockets and a stretchy front pocket) mean there are lots of options for easy access to essentials during the day. The lash points on the pack, including the hidden daisy chains, provide extra flexibility such as when I needed to strap my climbing helmet. For the most part, this pack carried all loads without missing a beat: the harness and straps were easy to adjust and weight transfer to the hips was perfect. I barely had any problem with sore shoulders on any of my walks. I’m also pretty impressed with the ventilation provided by the moulded EVA Z foam back panel; I was definitely less sweaty than with previous packs. 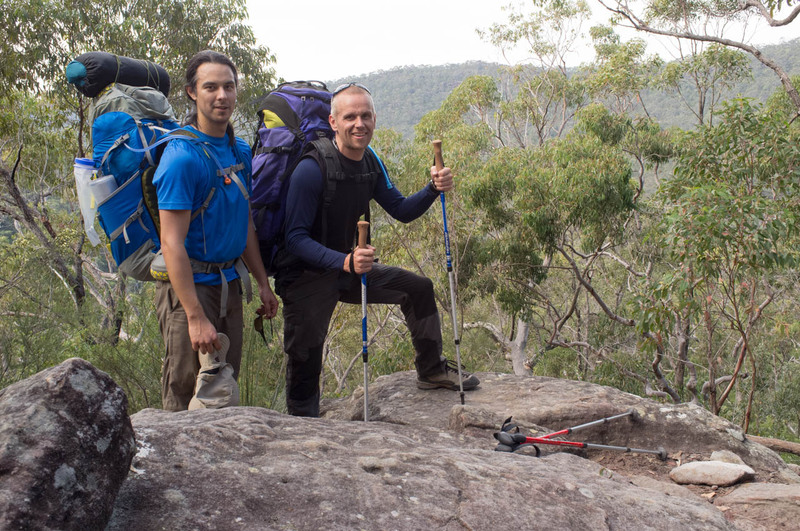 However, on Day 2 of my Mt Kuring-gai to Brooklyn walk, I had to take on half of my friend’s pack – mainly a tent and sleeping bag – after his knee gave out. By my estimates this pushed my total pack weight up to about 18kg. The pack itself is made from a 210D silicone-impregnated nylon fabric which is durable enough for general use and I expect it to hold up pretty well. The 420D base is consistent with other packs’ design (eg. the heavier Osprey Aether 60). However, the thinner stretch-fabric front and side pockets are susceptible to abrasion and rips: I tore a small hole in one pocket when I had to squeeze through some rocks (there was a hard plastic caddy inside the pocket). This is pretty standard for this sort of pack but means that this is probably not the gear to take off track into thick Aussie scrub. US$210 (60L) / AU$279.95 is a good price for a lightweight pack that performs admirably and is very well designed. I bought the pack from the USA before it was sold in Australia. It’s now distributed by Zen Imports. Only retailer I could find was Elite Outdoor Equipment. It comes in a range of funky colours; I got mine in “Marina Blue”, which goes nicely with my t-shirt in the photo below :-). 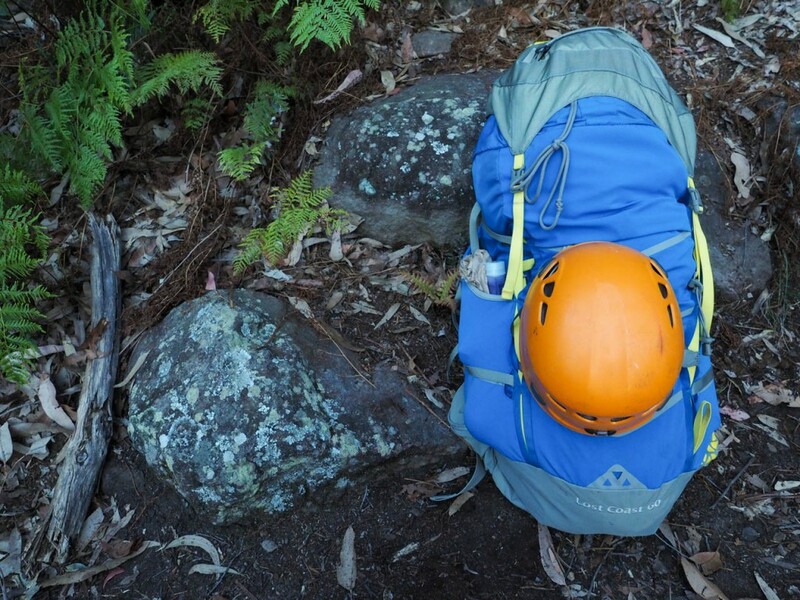 Lost Coast 60 backpack, packed down after a day at the crag, Thompsons Point, Nowra. 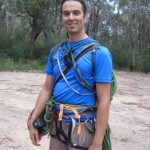 With Petzl Elios Helmet. Packs always look much neater at the start of the day! Sure you'll find lighter packs out there. You'll also find some better suited to off track adventures. However, the Boreas Lost Coast 60 is already my favourite overnight pack for shorter walks and also for all-day climbing trips. 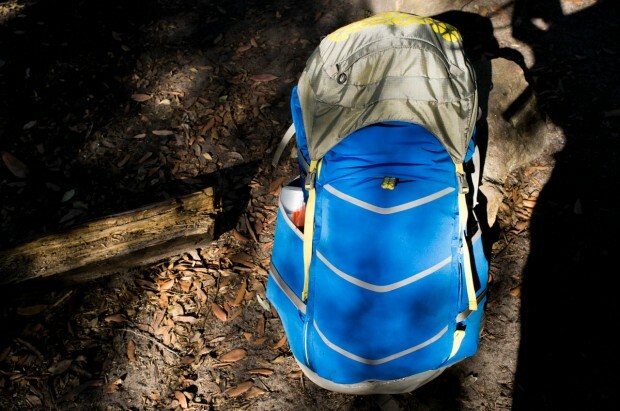 It ticks just about all the boxes, including the ability to carry a pack weight in the 12-16kg range without breaking into a sweat.